I have to admit to ambivalence about Thanksgivukkah. Why do I feel this way? It has something to do with the fact that, as interfaith families who celebrate both Hanukkah and Christmas, we spend a lot of time explaining that we don’t mix or merge holidays: we give each one specific religious meaning. I am happiest when Hanukkah and Christmas whirl to the farthest reaches of their orbital dance, at opposite ends of the winter calendar, giving each holiday the space it deserves. We don’t do Chrismukkah. But why not merge the “secular” American holiday of Thanksgiving with a Jewish holiday when they happen to overlap? Certainly, these two holidays have a natural affinity and synergy: both celebrate religious freedom, both encourage gratitude, and both feature rich feasting. What’s not to like? And yet, I have found myself side-stepping (until now) the frenzy of menurkeys, pumpkin latkes with cranberry sauce, and Thanksgivukkah songs. I would not be the first to note that part of the zeal for Thanksgivukkah this year is driven by commercialism, and that part of it seems to stem from a sort of sublimated or frustrated desire for the far-less-kosher Chrismukkah. And yet some of those who are reveling in the “hybridity” of Thanksgivukkah would be strongly opposed to interfaith families raising children with both family religions. The layers of complexity and irony here go deep, for such a giddy and essentially harmless holiday. True! I made exactly that point in Being Both: Embracing Two Religions in One Interfaith Family. But many will hear the message more clearly (and with less resistance) coming from a traditional religious leader, than from an interfaith families activist. An Orthodox rabbi can get away with embracing a Menorah Tree, while a second-generation interfaith parent, not so much. I keep my distance. So forgive me if the idea of turkey-stuffed donuts makes me (and, apparently, Kathie Lee Gifford) slightly queasy. We will take out our traditional brass menorah on Thanksgiving this year at sundown. It won’t be adorned with solstice greenery (we will celebrate the winter solstice on the solstice). The moment to light the candles for the second night of Hanukkah will probably arrive sometime toward the end of our Thanksgiving dinner. But I am not going to make a big deal about the overlap. I really do not want to come off as humorless, or as the Grinch who stole Thanksgivukkah, especially since this convergence won’t come around again for an estimated 77,000 years or so. 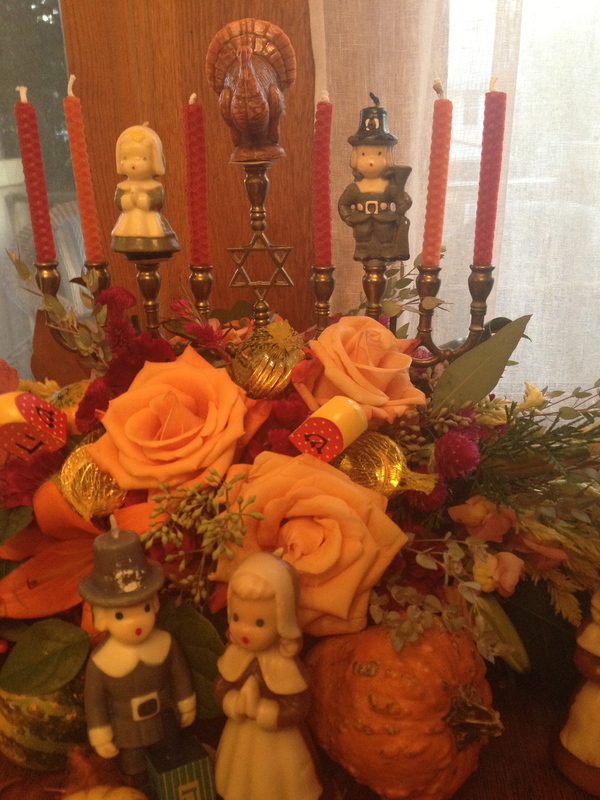 I was happy to loan one of my menorahs out to a friend–wildly talented floral designer Bethany Karn–so that she could create a Thanksgivukkah centerpiece for a local contest. I laughed with delight at her extravaganza of vintage pilgrim and turkey candles, gelt and dreidels, gourds and pheasant feathers. In fact, I am going to use it at a book launch event this week. But I am always very, very cautious when it comes to religious humor. If you’re Jewish, you can get away with hilarious R-rated Hanukkah humor, like my friend Sean Altman (aka Jewmongous) does. (His website warns: “not recommended for children under 13 unless you’re raising them to be sailors.”) And I suppose if you’re Christian, you can do the same with Christmas. For those of us born into interfaith families, we have to be careful when we venture into religious comedy in either direction, because we may be seen as “others” rather than “insiders,” and thus lose the right to joke around with impunity. So yes, I giggled at this off-color Thanksgivukkah horror film trailer parody. And I laughed til I cried watching Stephen Colbert’s attack on Thanksgivukkah. He can get away with this, I believe, as a Catholic, in part because of his ongoing dialogue with the (Jewish) Jon Stewart. And because, well, they are Stewart and Colbert. And I’m not. So I am just going to have to play it straight here. Happy Hanukkah. Happy Thanksgiving. Celebrate, and give thanks. cute, con, but why does Christmas get first billing….why not chanumas?